Hello again, if you've been following the JoS Blog Challenge have you noticed that so far the initial letters used are being taken from the designers first names? A little hint for you what to expect will be coming up in the not too distant future. So this time, it's the letter C and luckily I'd just received the Sweet Cupcake stamp set and coordinating dies. I'd also been asked if I would make a couple of cards by a very god friend, one for her daughter's 14th birthday and the other for her mum; I didn't ask her mum's age! I've known Chris for around 30 years, when she came to work as a fitter for the weaving company I was at. She was warned at the time that I was a tricky sort of person and she'd be best ignoring me! Well, red rag to a bull, if Chris is told not to do something, you know she will and we instantly became firm friends. Marriage, children. divorce, new relationships and moves have not diminished our friendship. We can go for weeks, sometimes months without contact but we have the knack of picking up where we left off and have this innate ability to send a message when the other needs a friendly word or two. Anyway, today I'll show you the card I made for Tiegan's 14th birthday. 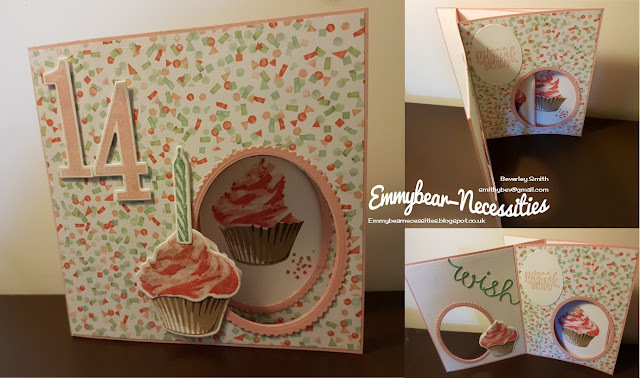 Once again I followed Jan B's You Tube video tutorial for a Peekaboo style card. I stamped a couple of cupcakes onto thick Whisper White and die cut to add to the front and inside left of the card. Because this stamp set is a 3 stage set to get the detail, I've used alot of colours! You could use a little less by stamping off for one layer and then using full strength for the next. I found a fabulous DSP called Birthday Bouquet, which is sadly now retired but worked perfectly and tied in the colours well as I wanted to create a girly card. I used a Wink Of Stella in clear to add a touch of sparkle to the cupcake adhered to the front of the card. I hope Tiegan likes this as much as I enjoyed making it. Great card, I love your choice of stamp set also Beverly. I've never tried a peek-a-boo card........another one for the must try list. Thanks, Peta, I recommend Jan B's tutorial for Peekaboo cards, she makes it so easy to follow. Link is in the post if you need it.